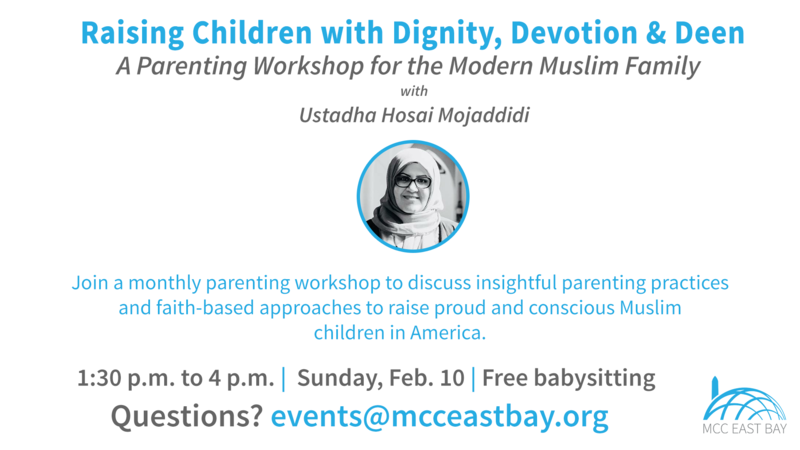 Join Ustadha Hosai Mojaddidi for the final session of this monthly parenting workshop to discuss insightful parenting practices and faith-based approaches to raise proud and conscious Muslim children in America. The discussion-based group aims to share a welcoming space with parents to raise children with dignity, devotion, and Islam. This is a parenting workshop for the modern Muslim family. We will not be livestreaming this event. We will be recording and posting the processed video later that week. Sister Hosai Mojaddidi: Hosai Mojaddidi is the co-Founder of mentalhealth4muslims.com where she advocates for and has written about various mental health related topics tailored for Muslims. She has served the American-Muslim community for nearly 20 years as an activist, writer/editor, mediator, interfaith organizer, and public speaker, covering a variety of topics including women’s issues, marriage/family, education, self development, interfaith bridge building, spirituality, etc. She currently teaches monthly classes for women at Ta’leef Collective and MCC East Bay. She also offers regular educational workshops for teachers and students locally.